Polka Dot Parlor is a hip boutique for everyone with a sense of humor and a little edge. It's where spirit, style and price are on point. 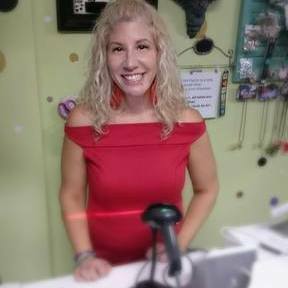 At Polka Dot Parlor, we strive to have an updated selection of clothing, vintage wares including handbags and fur coats, novelties, and other fun stuff. We have competitive prices, if you can find our cool stuff anywhere else. We value our customers' input and respect their pockets. By shopping small with us, you are helping a Mom support her family of three daughters and rescued pets. I am a mom of three daughters and a house full of rescued pets. I always had a passion for fashion, the darker side of humor and fun. I dress according to my moods and not always by trends. I enjoy having fun with fashion and getting the most bang for my buck. I opened this shop because as a former plus size gal I felt a need to have a cool boutique that all size ladies can shop at for edgy retro-vibed clothes together. Of course, I had to add a section for the guys who enjoy a shirt or hoodie. PDP is different because I don't just focus on your outward appearance. I want you to feel good too. We sell crystals, blessed candles, incense, novelties and more. We offer free parking in back lot. Metered street parking also available.